Preview: Good vs Evil, Jedi vs Sith, Scousers vs Norway Invitational XI. The Derby. I’d like to open this sermon of the Church of Saint Domingo with some choice words from the Honourable (don’t tell John McStay) Mr Duncan Ferguson. 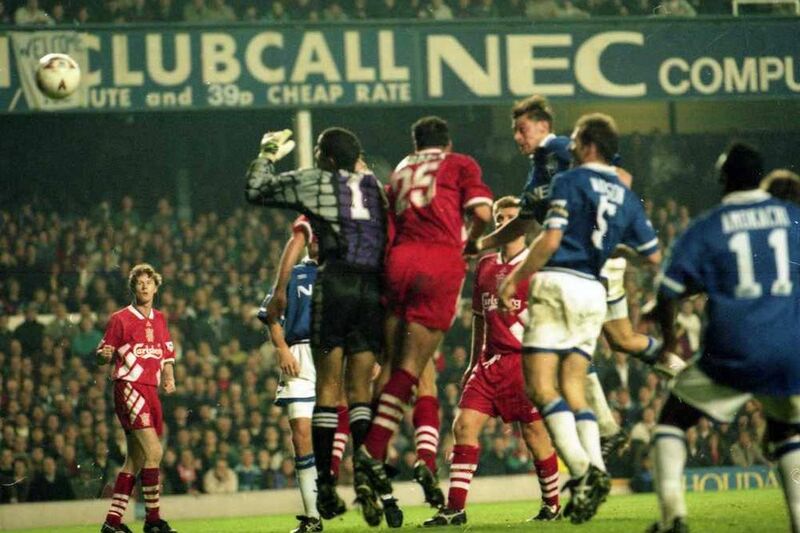 Of all the media sorts and former players who have stuck their oar in as the 221st Merseyside derby rears its head, not many encapsulate our emotions surrounding the event – for it’s more than just a game – than Big Dunc. He’s a club hero, a part of the staff, as close to the heartbeat of the Club as anyone can be – and he’s confident. There’s your cue, ladies and gents. We all love perusing the Guardian and Mail for their views on Merseyside and its people, don’t we? If you replied yes and meant it, go to that “X” in the top-right of your screen and click it. Cheers. But they’ve both been cunning enough to notice that the derby means a hell of a lot to us. I imagine many of you are reading this with that physical sickness deep in your innards, wracked by rising tension and blanking out the rest (as, I am told, there is) of the weekend. There’s something about Carl Froch, George Groves and Dr Who. Like the start of a mental Come Dine With Me line-up. But that feeling is good, embrace it. The sign of a true fan. 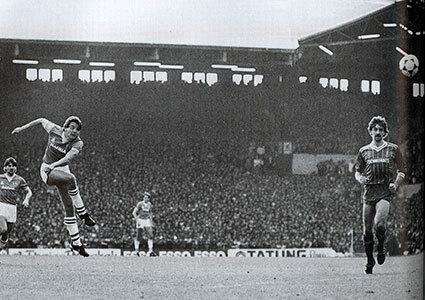 Then again, at the tender age of 18 I have not endured the strains of the derby for as long as many of you. Then again, my first memory derby is from 2001. You may remember it. The McAllister free-kick. And while it couldn’t get worse than that lowest of lows, it hasn’t got better. And if they beat us tomorrow, which is the worst feeling in football at any time, they will have won as many Goodison derbies as we have. They truly are our bogey team and the worst of all local rivals, as Dave Prentice rightly said. But it’s a new era, under a manager with a new philosophy, and the classic Everton way of having a player sent off at the word go and sweating for 70 minutes may be on its way out. But Roberto Martinez is a student of the same school as Brendan Rodgers, which could be a bit of an issue for entertainment. If anyone catches Liverpool when they go to Swansea, it’s awful. 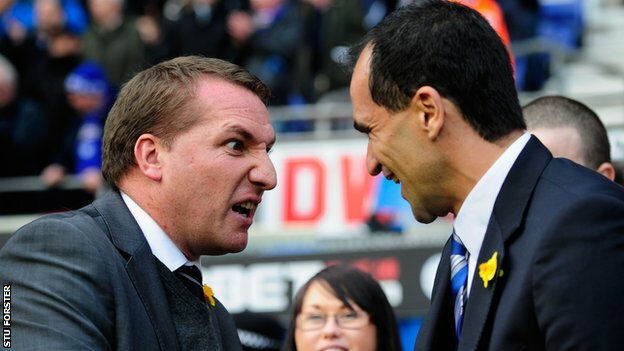 Like being in the Matrix, with two identical Brendan Rodgers’ going at each other with the same moves. Gah. But our Roberto has a bit of Everton steel on his side. That’s the hope. “I think there are certain positions on the pitch where it is better to know what to expect. There are others where it is better to be fresh and raw to use that talent in your advantage. “The creative positions are where you can take advantage of that fearless approach. “Defensively, you need to be well aware, to anticipate and to control a fixture like this is where experience is welcome. Well, well, well. That puts the cat amongst the pigeons. Hence, we can work out that Howard, Coleman, Jagielka, Distin, Baines, Barry, McCarthy and Lukaku are assured of a place in the starting XI – but who will make up the three that sit behind the beast? The fact that Liverpool will be playing Johnson and Henderson on the right and Cissokho and Coutinho on the left suggests that we should be putting some troublesome, pacy players out there. Gerard Deulofeu has been stomping all over Europe’s Under 21 scene like a twinkle-toed Godzilla this week, so he may be in with a shout. 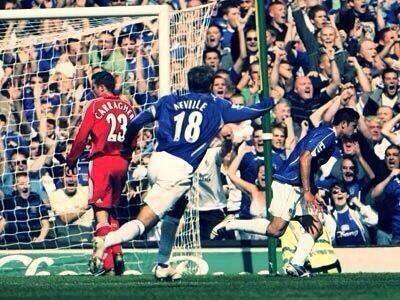 Kev Mirallas caused all sorts of problems in last season’s Goodison derby too. But whether these two or Steven Pienaar and possibly Steven Naismith start will show Martinez’s intent for the game. The same applies for Barkley or Osman in the centre. Don’t get me wrong – I am quite a Naismith fan. He’s busy, works harder than any other player and likes to hit the box to grab a goal. Osman has experience of the derby and as much passion as any Blue. But for that jolt of excitement to kill the mutated man-sized butterflies in our stomachs, positivity may be a key that we have lacked for so many years. Who has decided derbies for us? Arteta. Johnson. Cahill. Campbell. Cadamarteri. Kanchelskis. Big Dunc. They’re all from the last two decades. And they all have that mix of grit and skill needed. In terms of treating this as an ordinary Premier League game – as if – we’re heading into a game against a side very much in-form after beating the Premier League cling-ons that are Fulham and West Brom at home. In their last two away games, they have conceded two goals each time. And one of those was against 10-man Newcastle. 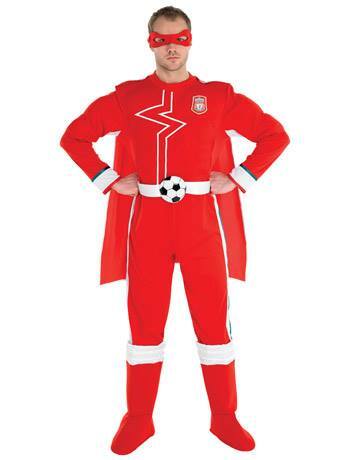 But we’re in worse form, failing to beat Spurs and Championship club in Premier League clothing Crystal Palace. What was missing for those last two games? Creativity, flair, finishing, provision and support Lukaku. To sum up in two words; Ross Barkley. No wonder he’s being tipped to be a potential game-decider. And now back to having a crack at the Kopites. Trying to instil reason in their tiny, deluded psyche is like teaching a lemon to tap-dance. Even if you believed it was possible, it isn’t. Once upon a time they were simply wools from Runcorn who turned up to games if they could be arsed and the rugger wasn’t on. They were insufferable morons, but at least they could point out Liverpool on a map. Now you walk down Anfield Road on a Redsh*te matchday and there are backpacks and cameras everywhere. It’s almost as if Buckingham Palace has relocated. 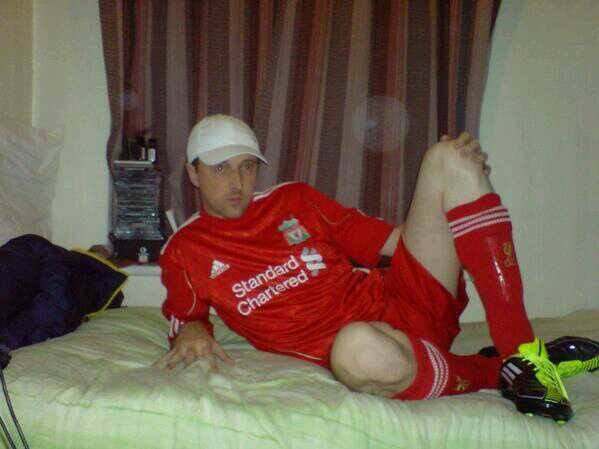 Hence the verbals are now on Twitter, exposing corkers like the Kopites below as the plebs they truly are forever. Just remember – one of us is worth twenty of them. If I had to predict a score right now, I’d say 1-1. 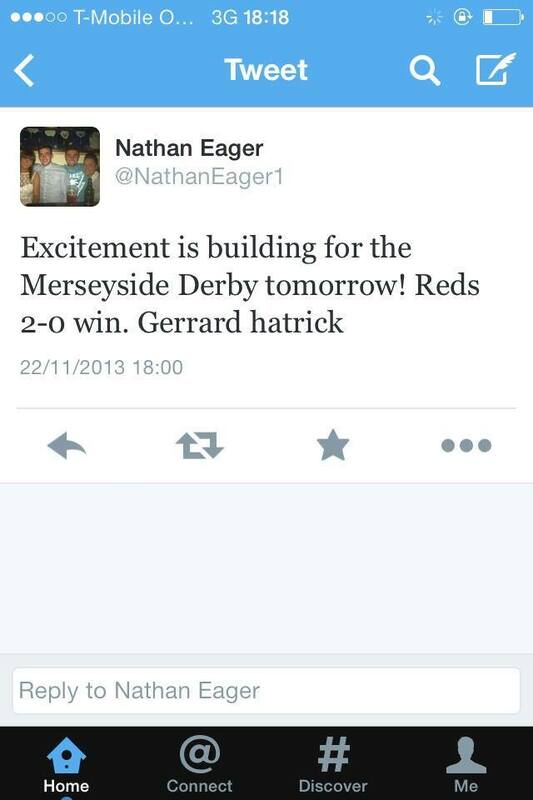 With a Gerrard hat-trick of course. Two similarly talented teams with almost identical styles of play will cancel each other out on the most part, but there’s enough attacking talent on the pitch to get a couple of goals in. We play our cards right, ride out any onslaughts and get a lucky break…hang on, that’s the old philosophy. We’ll make our chances, and if we take them we get a deserved win. But the problem with the derby is that our hopes and dreams lie in the hands of the players and management staff of the club. This chosen few will decide if we enjoy tomorrow as one of our favourite days as a fan or spiral into a whirl of depression, egged on by the mindless drivel of those Red scrotes. It’s up to you, lads. There’s so much more to say, but I’ll simply conclude with those magic words from our Dunc: Bring on the Reds. And come on you Blues.